WiscNet hosts it's own Speedtest.net server in order for WiscNet members to test their upload and download speeds specifically across WiscNet's network. The WiscNet Network Weathermap is a graphical representation of WiscNet's backbone utilization, updated every five minutes. WiscNet's IPERF testing allows WiscNet member organizations to test and troubleshoot their connection by flooding it with packets of data. View and subscribe to email and/or text messages for scheduled and unscheduled outages. Notifications can be customized to just your organization, your region, or all of WiscNet. 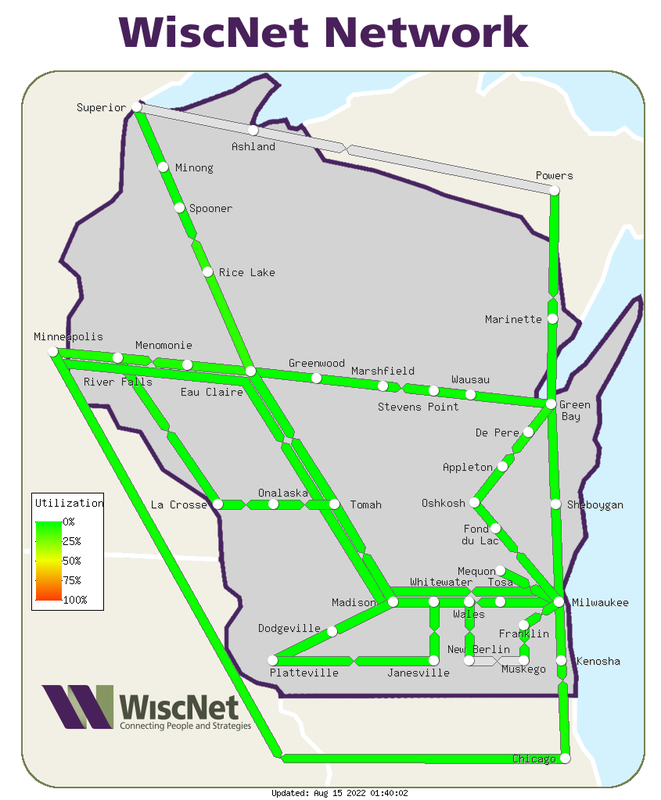 WiscNet's bandwidth graphs allow WiscNet member organizations to see real-time graphs the amount of data over their connection to WiscNet. Straight from WiscNet's network engineering team, a collection of public-facing information about their projects and work. Interested in adding or updating a DNS record with WiscNet? Please take a moment to complete the form below.